Will Polyethylene Foam damage instrument finishes? I don't know whether Polyethylene foam will hurt anything, but what I used on my rack is carpet scraps, and that works very well. 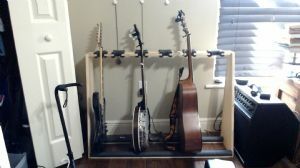 My rack holds six banjos, and is built so the banjos sit in slots with the rim and neck padded with the carpet pieces. 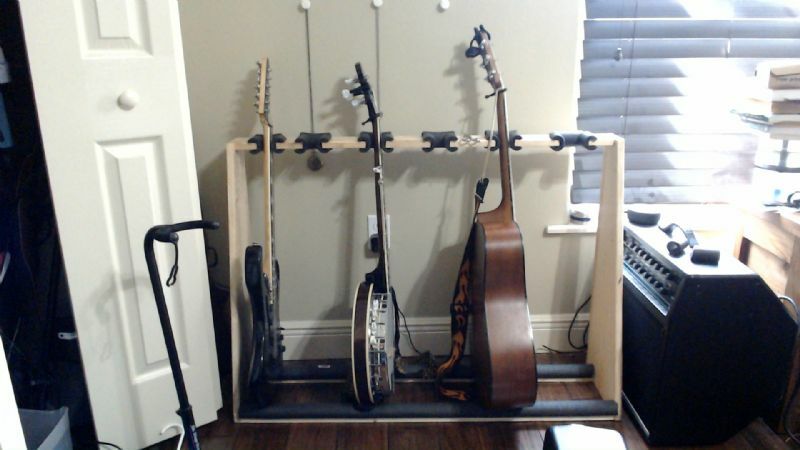 No way a banjo can be knocked over in this rack. and the carpet doesn't damage the finish. All the companies that make stands have went to proprietary formulations of the foam that they use to protect instruments. The only thing that's safe to say is there might be damage if the finish (particularly nitrocellulose) is allowed to stay in contact with the foam over extended time. Just what that time is ends up being your responsibility. All the higher quality instrument stands now come with a disclaimer that they are "safe" but there's no responsibility on the manufacturer's part for any damage incurred. I researched the foam products pretty extensively and even contacted manufacturers of foam tubing. The best answer I could get is that "EPDM" foam is generally safe, but not in all cases. You can take a look at what String Swing covers their hangers with. It gets consistently high praise from owners who haven't sustained damage from their use. The stuff sold as pipe insulation isn't something I would personally trust. Foam or Padding that won't damage Nitro finish? My foam padded instrument stands totally trashed the resonator and other contact points of my Vega Martin VIP. The finish is a French Polish. It ate away the finish, the stain and even curled the decorative marquetry on the resonator. Looks like it might have eaten into the glue as well. Since all of my banjos are Vega--No more foam! I'm a model railroad operations hobbyist. Many paint jobs on model locomotives and rolling stock have been ruined by (at least) older foam packing materials. both in the time it took to ship them to the U.S. from Asia and even worse in long term storage. Not sure what they were exactly, but I'd avoid foam if you can use something else to prevent whatever off gassing they might give off. Leather maybe? I've never had a problem with surgical silicone tubing for necks on stands over many years but don't know about thicker/wider silicone pads. Carpet scrap works, felt works, and synthetic saddle skirting fleece works, though I only have that because I used to make and repair saddles. I used some of the saddle skirt fleece to line a banjo case once which was covered on the outside with tooled leather. That case was made for a rodeo cowboy, and he liked the connection to saddlery. Worked on his banjo about a year later and the finish was in fine shape, but it wasn't lacquer or shellac (french polish). I have made a number of rifle scabbards lined with the synthetic fleece and never heard of any problem with it damaging the finish on the rifles.